I just saw a new patient, a fifteen year old boy with a pretty poor posture. What shocks me the most about this is that I am no longer shocked. I almost now get surprised when I see a new patient in my practice with a good posture. 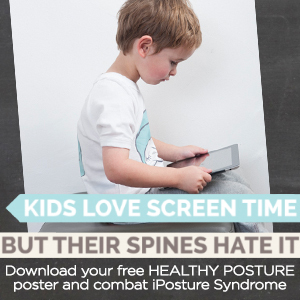 There is no doubt in my mind that children’s postures are deteriorating and no matter what else we do for our children’s health we must do more when it comes to their posture. Your body can store more energy than it uses leading to weight problems. Break up screen time in to half hour chunks. After half an hour our lower back support muscle fatigue and allow us to slump. Laptops do not allow for good ergonomics. If your child has a laptop they absolutely should be using an external keyboard so that the height of the screen can be at eyelevel without straining the eyes. The Rain Design m Stand is about $80 and allows for the computer to be lifted neatly to eye height while leaving plenty of room for cables and keyboards. If your child just can’t resist sitting on the sofa then Ikea sell a laptop support called a BRADA laptop support for $7.99. Ollie Owl has a lovely simple printable download with series of stretches to minimise postural stress. And of course, protect your children while they sleep with an Ollie Owl contoured pillow for children. The research is out there. The government is on it. As parents it is now up to you!